Planning is a long game. Those of you working in the field know this well. Movement toward a community vision is heartening. Small victories matter. And keeping momentum is ever so important. Hearing about the positive steps forward from the communities we’ve worked with through APA’s Community Planning Assistance Teams (CPAT) program is always great news. Experienced and committed planning professionals volunteer their time and expertise to places around the country (and sometimes abroad) every year through CPAT. They help spread and demonstrate the value of planning and they contribute creative ideas and new energy to challenging issues faced by the communities they work with. When we get good reports from the communities we’ve worked with over the years, we applaud their success and recognize the efforts of our CPAT alumni in helping them reach their goals. The Deerfield Beach CPAT members with city planning staff members on the final day of the team's visit in March 2015. Photo by Ryan Scherzinger, AICP. Steve Graham, AICP, the assistant director in the City of Deerfield Beach’s planning and development services department reports that “the CPAT study [in 2015] ultimately led to land use and zoning changes that were implemented in the summer of 2017. 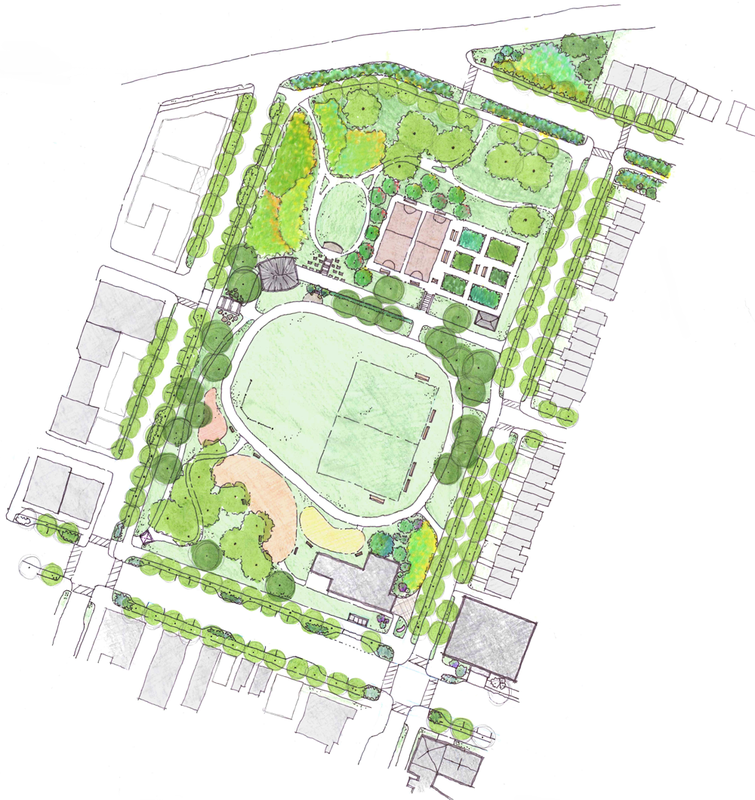 The Brooklyn CPAT in Baltimore created a design plan for Garrett Park as part of a neighborhood revitalization and green infrastructure plan for the neighborhood. Drawing by CPAT member Catherine Mercier, AICP. In the Brooklyn neighborhood of South Baltimore, a CPAT developed a Community Action Plan in 2016 to provide green infrastructure to increase resilience and achieve other community goals. "It is leading to bigger concepts around local workforce development, community revitalization and putting [the neighborhood] on the map for interconnectivity with larger area green infrastructure plans,” Dorsey said. Phase one on the park may begin in a few months. They’ve also engaged in conversations with Park Rx America and the neighboring Family Health Centers of Baltimore about park prescription programming in Garrett Park as a South Baltimore pilot. CPAT members in the Brooklyn neighborhood of Baltimore, together with CCYD Director Michael Dorsey, show off the Garrett Park design plan drawing. Photo by Brooklyn community member. We look forward to more from communities our volunteer teams assisted. Meanwhile, CPAT is in the beginning stages of several new projects. Teams will work on downtown revitalization efforts in the small towns of Page, Arizona, which is located near Lake Powell, beautiful Antelope Canyon, and Horseshoe Bend; and Taft, California, in the southern part of the agriculture-rich Central Valley. A team will work with the island community of St. Thomas in the U.S. Virgin Islands amid their continuing recovery efforts from two, back-to-back category five hurricanes (Irma and Maria) last September. And for the first time, a tribal nation requested the help of CPAT. A team will work with the Quinault Indian Nation in Washington on a site plan for an important new cultural campus they envision on the Pacific Ocean coast. Learn more about the CPAT program and share it with communities that may be interested. You can also let us know you’re interested in offering your expertise on a team by filling out the online volunteer form. Contact us at CPAT@planning.org with any questions or inquiries. Top image: Rendering by Adam Rosa, AICP, from the Deerfield Beach, Florida, CPAT. Ryan Scherzinger, AICP, is APA's professional practice programs manager.